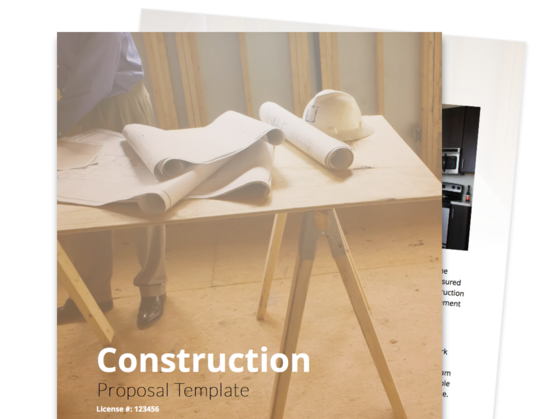 Creating a construction proposal has never been easier with our construction proposal template. Whether your business is residential or commercial construction, our template will help you craft a pitch to show off your company’s experience. The template includes sections to showcase past projects, define services, execute a contract, and more. Make use of a professionally designed and easily customizable construction proposal template that’s sure to wow your potential clients. Efficiently convince your potential customer that you’re the right construction agency to trust with their construction job by showcasing your most notable and successful past projects. Inspire customer confidence in your construction agency’s ability to get the job done with glowing testimonials from your previous clients. Present an easy-to-understand summary of your offered professional construction services that potential clients can quickly refer to. Construction jobs can be very huge and very expensive undertakings, and as such, many clients will always want to make sure that they’re dealing with a trustworthy and hardworking construction company. This section gives you the opportunity to prove to your prospective client your company’s knowledge and expertise, built on top of a rock-solid foundation of experience, hard work, and integrity. Make sure to make a reference of the noteworthy clients you’ve served in the past and how satisfied they are of your company’s work. This section lets you show off the successful construction projects that you’ve had in the past. Make sure to feature them with clear, high-resolution pictures that show off their good side. After all, barring an on-site ocular inspection, this will be the only way your potential clients can judge the workmanship your construction firm is capable of delivering. Pull this off right, and you’re sure to close that deal. Another potential deal-closer, this section lets you publish the glowing reviews and testimonials that your previous clients may have of your company or a specific member of your staff. Be sure to take the most positive ones, as this section can easily be a huge factor in convincing your potential client to go with your company. It also serves as a way to reassure them of your construction firm’s integrity through the good standing you obviously have among your previous clients. This section lets you enumerate the various construction-related services you offer, and the specific sectors in which you provide these services for. This can potentially help you get construction job referrals, especially if your prospective clients have contacts in other sectors. As such, make sure to fill this out accurately. You and your client need to be aware of your agreed-upon obligations and responsibilities, as your entire working relationship relies on having those requirements fulfilled to both your satisfactions. This section of the proposal allows you to specify those details in a clear, concise, and legally sound manner. To help you easily close your next deal. Your proposal will look great on any device! 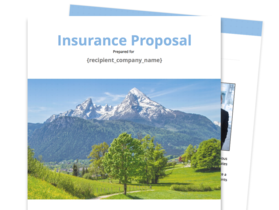 Whether it's Life, Car, Home or Health Insurance, this versatile Insurance proposal template will do the job just right. Track which insurance plans your client is interested in. Allow them to pick from a menu of services with Optional Line-items. 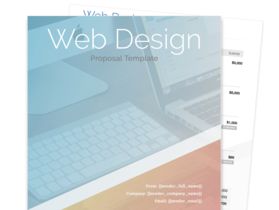 Save time with this Web Design Proposal Template and represent your brand well. This template includes description of services, pricing, and a web design agreement. Every great solar company should be sending great proposals out to their prospects. 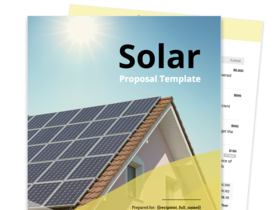 With this polished solar proposal template, you can introduce your company, educate your customer about the process, and quickly configure your solar estimate.